A quintessential canoe country trip that any paddler or outdoors lover should experience at some time in her life, the Boundary Waters is a special place that offers many rewards – an unspoiled landscape, wilderness camping, solitude, lots of loons – but it also comes with a couple caveats and considerations. Time: Put in at 9:20a. Out at 5:30p. Day 2: Rested, swam, fished and napped in a hammock with a book. Time: Put in at 9:15a. Out at 3:20p. Time: Put in at 10:00a. Out at 2:30p. Day 5: Rested, swam, jumped off tall rocks, fished and hung out in a hammock. Time: Put in at 8:15a. Out at 3:15p. Time: Put in at 8:00a. Out at 9:15a. Wildlife: Bald eagles, loons, tadpoles, turkey vultures, prairie chickens, dragonflies, red squirrels, beaver, ravens, butterflies, mergansers, wood ducks, turtles (including one laying eggs before our eyes), teal ducklings and lots of fish but zero moose. Friends of ours have gone to the Boundary Waters (officially called the Boundary Waters Canoe Area Wilderness, or BWCAW) every summer for the past 8 years. For the last several years now they’ve always invited us to join them, and each year we say something like “Oh hell yeah! Sounds awesome. Let’s totally do this!” And then each year something invariably comes up, gets in the way, and puts the kibosh on the trip. But this year, 2016, really was the year to join them finally, no matter what. Before we delve into the trip details, a few points of consideration should be taken since this trip is unlike any other we have on the site. The Boundary Waters is an enormous place – more than a million acres large and just shy of 200 miles wide. As such, there’s more of a western and eastern section of the park than there is a northern and southern one. Our trip was in the western section, based out of Ely, Minnesota (pronounced EE-lee). (The eastern terminus is based out of Grand Marais.) Of the 1200-some paddleable miles of canoe routes, our trip covered 44 miles, which is basically a skimpy 3% of the whole wilderness! It’s mainly for this reason that we do not profess any degree of expertise about the Boundary Waters proper. That said, we’re more than happy to share our experience there; and whenever possible, we’ll furnish basic info about the place – the permitting process, what to expect, etc. Our route took an unconventional east-to-west approach, all of it essentially on the Kawishiwi River (more on that in a moment). Unconventional in that more paddlers would sensibly choose to go with the usual direction of the wind, that being west-to-east. But we followed the natural direction of the river (and when we say “river” we really mean chain of lakes), even though there is zero current and no discernible gradient until the portage-required rapids. We got lucky in that we had only one genuinely bad day of wind (the other days being minor nuisances paddling against the wind). Also, we had only two days of paddling in the rain, the last two days of the trip at that, by which point we hardly cared and were ready to be done with things anyway. We began this trip on a Saturday morning and then took out the following Friday. Since it’s a 7+ hour drive from Madison to Ely, we stayed the night in Ely at a rented house/hostel owned by the outfitters from whom we rented canoes, purchased our permits and received our shuttling services. We began early and busted our butts the first day and camped two nights at our first site. On day three we stayed one night at another location. On day four we stayed two nights at a third site. On day six we busted our butts again so that we ended up as close as possible to our exit point while still savoring one last night. Our final day of paddling was the morning of rendezvousing with our shuttle. We strongly recommend staying at one site for two (or more) nights, since it cuts back on the amount of work you have to do. All backpack camping requires work, of course, especially if you’re out for a week (or longer). But this is especially true when you’re lake paddling and portaging two 17’-long canoes over and over. Finally, this route technically follows the orientation of the Kawishiwi River. But this trip, indeed virtually anything in the Boundary Waters, is all lake paddling. Think of the Kawishiwi as a chain of lakes not unlike the Oconomowoc or Yahara Rivers. There were several pleasant segments where the river did feel more like a river and less a lake, but there never was any current. Indeed, the only times when you’ll appreciate any gradient is at the portages, where the river constricts through rock walls and tumbles around boulders and ledges. Unfortunately, none of these rapids were runnable for a few reasons: natural objects (like trees) were unnaturally staged to prevent attempting to paddle through; the water was almost always too shallow to attempt running any of the drops; and the canoes we used were ultra-lightweight rentals, meaning A) if we damaged the boat, we’d have to pay for it and B) if such damage made the boat unpaddleable, then we’d be totally screwed and stranded in the middle of nowhere. Besides, however light the boat itself was (42 lbs, for ease of portaging), there still is the weight of 2 adult paddlers and a couple hundred pounds of gear to consider. And whitewater canoeing is much more complex than whitewater kayaking. Thus, as tempting as it was, we had to pass on the rapids. It was frustrating insofar as finding out your favorite ride at the amusement park was closed, but it was something you got used to. Not to beg the question, but this was the Boundary Waters, baby! The Boundary Waters! For paddlers in general, and Midwesterners in particular, BWCAW is like going to Mecca. That it took us so long to finally get there is a bit embarrassing, frankly. But it’s just gorgeous up there. The relatively unspoiled landscape (the area is routinely at risk of being damaged by sulfide mining) is palpable, even from the car during the drive, to say nothing of once you’re on the water. And there’s something indescribably thrilling about setting off for a week-long journey from Point A to Point B 40 miles away, come what may in between. While that can be said about a river trip, too, what’s especially cool about such a journey in the Boundary Waters is all the routes you have to take along the way. One wrong turn, and suddenly you’re lost, and nothing before your eyes looks like what the map tells you that you should be seeing. (This did not happen to us, for the record. But some of the lakes up here are just ginormous – and many are even far larger than those we encountered on our trip.) Navigating is part of the fun on such an excursion. It’s both a test of one’s skills and a testament to the awesome surroundings of the place. Our favorite paddling days were Days 1, 3, and 4. Day 1 was the most diverse and well balanced between river and lake, small and far portages, a lush landscape and one still singed to a crisp from a wildfire a few years ago. Day 3 had the most impressive geology, at least in terms of rock outcrops and cliffs – one of which features two prominent (but possibly forged) pictographs. 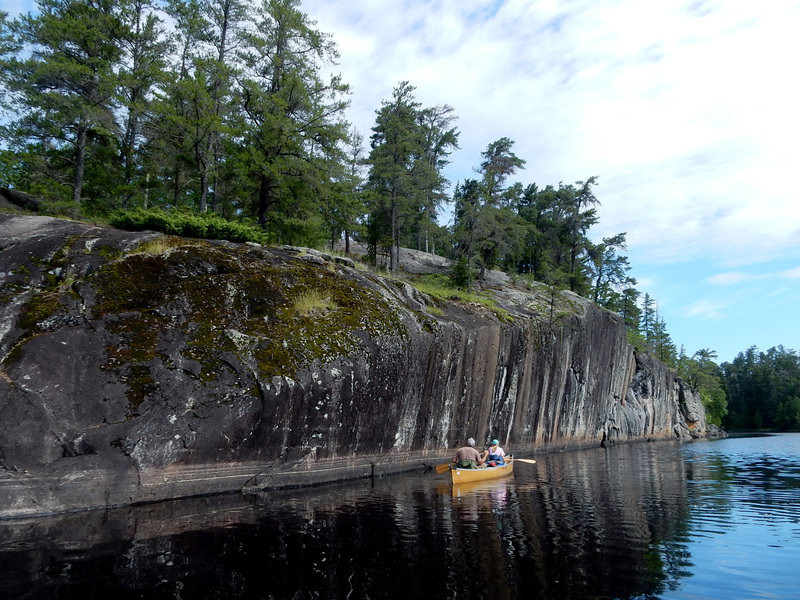 And Day 4 also was a pleasant mix of lake and river paddling that culminated in our finding an entire island campsite all to our own, surrounded by several other pretty islands, rock outcrops, and rock shelves, in a setting that was simply stunning. Something we never thought we’d say is that we actually enjoyed the portages! I mean, who enjoys portages, right? What’s different about portaging in the Boundary Waters (at least on our trip, but this is generally the case) is that each correlates to a set of rapids, not a logjam or downed tree or dam, which is the case when paddling rivers. In an ideal world, one could run the rapids. But in the real world of renting lightweight canoes that are your sole means of transportation in the wilderness, this simply wasn’t feasible or pragmatic – as mentioned above.) What we liked about the portages – and most paddlers will confer this sentiment – is it breaks up the monotony of paddling and allows you to stand up, stretch, and walk around. Looking at and listening to the crushing tumble of the rapids is pretty cool, too. But another serendipity of the portages is each acts as a kind of informational trading post between fellow traveling paddlers, especially at some of the “hub” lakes in the park (re: certain lakes that offer a variety of accesses to/fro more remote sections of the whole Boundary Waters). Sometimes you’ll find a group of canoes hot on your trail and nipping at your heels, but more often you’ll meet fellow paddlers coming from the direction you’re heading to (and vice versa). Usually, you’ll say hello and ask how things are going, where they’re coming from, how long they’ve been out there, etc. You know, passing ships in a night. It may be nothing more than that. Or someone might have a hot tip of a must-do or a must-don’t, a golden nugget of info that could come only from a person in real time, not a book. Don’t go to the right of such-and-such rock over here, or there’s a much less muddy portage trail 50’ west of the official one on Lake Whatever, or an amazing campsite with your own private beach is just past this one peninsula, etc. A father and daughter from Poland, church groups from Missouri, teenagers from the Twin Cities – you never know whom you’ll you encounter at a portage trail. If only for the sake of unique novelty, our favorite campsite on the trip was on an island all to ourselves on Lake Insula. There was no beach per se, the island having a rocky coastline instead. (Here and so many places elsewhere, the Boundary Waters really reminded us of the Maine terrain, which also is quintessential canoe country.) We stayed at this site for two nights. On the morning of the first night we noticed fresh diggings in a rare sandy spot a few feet away from the water. We guessed a turtle had been there during the night. Later that day she returned and began the torturously slow process of unabashedly digging an additional hole into which she’d lay eggs. Watching this was pretty remarkable. The way they do it is one hind leg at a time, digging out from behind with the claws of her feet, while her forearms were hunkered onto the sand in front of her. One foot-swipe at a time. Very, very, very slowly. At one point Timothy joked that he’d seen drying paint lay a faster egg! But eventually she somehow knew when deep enough was deep enough, and she’d begin. She’d tuck her head inside her shell, her whole body would buckle like a hiccup, and then out with fall an egg. 3-5 per hole. When she was done, she clamber back into the water and swim away, probably exhausted, poor thing. But we’d never seen anything like that, and it was quite a phenomenon to witness! While the following might violate some holier-than-thou, Sigurd Olsen-esque accord about being in the Boundary Waters wilderness, we had just silly fun jumping off rocks into the water 10-20’ below. Come on! It was fun as hell! Our two favorite spots for this were at our campsite on Fishdance Lake and then an appropriately large megalith named “The Rock” on Lake Insula (a tip we received thanks to a random stranger during a portage on our first day). On both our first and sixth days of paddling we were privy to the awesome ravages of the Pagami Creek wildfire in 2011. Out here in the Midwest, we hear of wildfires happening more in the west – the Rocky Mountains or Sierra Nevadas. Over 92,000 acres burned in a slow conflagration that lasted about a month, the smoke from which could be seen as far south as Chicago! Shrub vegetation has come back, but the trees still stand as charcoal-black sentinels to the fire’s wrath. The macabre beauty of such a backdrop is how much of the natural landscape one can see without all those tree limbs and leaves. Seeing the aftermath of a forest fire is like seeing an X-ray of the land. Each tree stands out, no longer subsumed by the former forest itself. It’s a breathtaking sight to behold. Finally, we really liked and wholly recommend the outfitter that we went with, Spirit of the Wilderness. Not only do they sell and rent everything you could possibly need for an outstanding trip, they’re super-nice, patient, and knowledgeable folks, running an honest-to-goodness family business. They even have a hot shower at their headquarters for when you return. Fun fact, they remembered our friends from a trip two years ago and when they all saw one another at this year’s Canoecopia, in Madison. They even commented on the fact that one of our friends had grown a beard since the last time they saw him! Now that’s customer service. To put this in perspective, a few things should be dragged out into the open. These are our own sentiments, some of which may be universal, some peculiar and admittedly partial. Take them all with a grain of salt. But at the outset, it’s a tough sale to us if the premise is as follows: we’re going to paddle seven days in a row in a canoe with another person only on lakes, do a lot of physical work, never drink beer, be totally subjected to the whims of weather, be bitten by flies and mosquitoes without mercy, have to drive 15 hours roundtrip for this and pay several hundreds of dollars to do it as well. To us that sounds either insane or masochistic. One, we generally dislike flatwater lake paddling. Lake paddling in a 17’ -long canoe with someone else whose style and druthers may not be fully in synch with your own can be challenging and sometimes frustrating (even if it’s your best friend). Doing all that against the wind, or while it’s raining, or both, is even more frustrating. Especially when you’re tired and sore, which is pretty much always. Two, you can’t have beer in the Boundary Waters. OK, while we respect this rule and understand where it’s coming from and why, still, paddling and beer go hand in hand. But we abided by the rules like good stewards. Three, a trip like this is a lot of work; so when you tell your friends and coworkers that you’re going on “vacation,” that comes with quite a caveat: at almost no point will you be relaxing, either because there’s no time or there’s just nowhere comfortable to relax. Or you’re too tired. Or the mosquitoes and flies force you to retire to your tent, at which point you’ll probably just fall asleep. The campsites in the Boundary Waters do generally have a log or two to sit on, which is a nice touch but none too welcoming after sitting in a canoe the whole day. Unless you pack a hammock along – and trust us: you should seriously do this, at least one hammock! – there’s nowhere to lie or sit in any way that resembles “relaxing.” And then there’s the daily litany of tasks: filter water, light a fire, make breakfast, wash dishes (which means cleaning everything and rinsing away from the water, not in the water, so as not to pollute the water), put everything away, break down camp, stow everything into backpacks, load up the canoes, paddle to the first portage, take all your gear out of the boats and set it aside, portage the canoe on your shoulders, walk back to pick up your gear and hope you can do it all just in two walks without making a third trip, then put all the gear back inside the canoe, paddle to the next portage, repeat all of this in and out and back and forth however many times on any given day of paddling and portaging, eventually find your next campsite, take everything out of the canoe, take everything out of the backpacks, set up camp, find firewood, light a fire, filter water, make dinner, wash dishes, etc. Day after day, friends. Hardly a vacation. And if it rains, well, then it’s just a soggy, muddy, grumbling version of this. Four, we’re just gonna come out and say something that’ll possibly sound downright heretical to some paddlers: while the whole wilderness area thing is mighty awesome, the landscape does get a bit monotonous after awhile. Hang on a second – don’t throw your rotten tomatoes at us! First, bear in mind that what we saw is 3% of the whole BWCAW. Second, what we saw was quite striking and singularly beautiful compared to our own backyards. But, well, after the third day or so one island or rocky hill begins to blend in with every other almost identical island or rocky hill you’ve already seen – and will continue to see. We can’t say that anything really seemed magnificent, even though there’s no shortage of pretty. Five, the mosquitoes are a pestilence that can only be described as downright Biblical. They’re bad in the morning, buzzing in the hot afternoon, and are seriously a scourge of all things holy at night. For better or worse, you’ll hear the swarm approach, slowly but without wavering. That’s your cue to run – don’t walk – to the tent and seek shelter. It won’t matter how much protection you take – bug spray, head net, long sleeves and pants, socks, shoes, whatever. They’ll still get you, still surround you in a cloudy crowd of hundreds – we’re not exaggerating. You can buy black market 100% DEET, and it still won’t matter. Seriously, unless you’re lathered in kerosene, expect the pesks. And if it’s not mosquitoes, it’s flies – biting flies, horseflies, deerflies, you name it, they’re tiny saws with wings. And they stalk your ankles. When not buzzing around you and gouging out your shoulder blade, thigh, or back, they’re lurking in a shadowy corner in the boat, biding their time, waiting for you to be distracted, then sink their fangs in your feet – your ankles in particular – like being pricked by twin syringes. Six, unless you’re using your own equipment, you’ll actually have to pay for this “vacation.” For the two canoes, bear barrel, permit, fishing licenses, 1-night hostel rental, and 2 shuttles, the cost was $1200. On top of that was dinner in Ely the night before we set off, followed by lunch in Duluth on our back to Madison, and 2.5 tanks of gas from Madison to Ely and back, there’s another $350. And then of course is the cost of all the food you packed. For kayakers who are used to paddling down rivers and spending exactly $0 on any given trip, having to pay $500-600 for lake paddling in a canoe, without beer and never really relaxing came as a jarring surprise to us. But this is cynical thinking – someone who knows the cost of everything, but the value of nothing. Can you put a cost on pristine wilderness? Spectacular sunsets, an explosion of stars at night, or mystic fog hovering above the water at dawn? The echoic call of one loon across the bay to its mate? Staying on your own island for a night or two or three? Picking wild blueberries from a plentiful bush and adding them to the pancake batter for breakfast? Catching bass at the base of whitewater rapids and then frying that fish an hour later in a pan on a fire whose wood you yourself split? Splattered lichen patterns in every shade of slate gray, iron blue, raging orange, and foamy green, on rocks and cliffs billions of years old? It’s certainly worth the nominal cost of the permit to enter the park. Whatever costs are associated with the trip after that is up to your own personal circumstances. But it’s probably worth it, whatever the cost. Unless you’re a glutton for punishment and like pumping filtered water, or have enough patience and planning to boil water and let it cool, we cannot recommend strongly enough in purchasing a gravity bag for your water. Just be sure you know how to use – and repair – it first. And pack an extra filter, too, as the water in the lakes is very heavy in minerals and metals. We rented a bear barrel from our outfitter, and it was fabulous. Totally sealed and animal-proof, it comes in a backpack for ease of portaging. Definitely worth the investment or rental cost! We said this already, but it’s worth repeating: get a hammock. Thank us afterward! And if you don’t already have a good canoe seat, preferably one with a cushion and strong back support, don’t even think twice about this; get one! Not only will it make the paddling itself more comfortable (which, let’s face it, is what you’re doing for most of the daylight hours, but then you’ll have something more comfortable than a bumpy log once you’re at your campsite. We would definitely recommend this trip to anyone with the time, inclination, and ability to do it. We ourselves probably wouldn’t do it again only because there’s just so much more to the Boundary Waters that we’d like to see. But this trip truly was a remarkable experience, one we’re very glad to say we finally did! Technically, 88 miles, which is insane. We chose to make this trip more of a journey by starting at Point A and going to B (actually, A to B, B to C, C to D…etc.). We paid for a shuttle to our put-in and then again at our take-out. More common is doing a there-and-back trip and simply leaving your vehicle at the entrance point, thereby doing no shuttle. Arguably less adventuresome since half of what you’ll see is what you saw already, but way less complicated – or expensive. The landscape becomes rugged very soon. The outlet of the Kawishiwi River from Lake Kawishiwi. Balanced rock on a portage trail. A delightful little portage trail. Sometimes the surroundings felt like a southern cypress swamp. No current, but still a river. A very easy portage/pull-over around a giant beaver dam compound. The base of the rapids at the bottom of Lake Malberg. Lake Malberg has tons of great rock formations. An ethereal sunset at our campsite after a long first day of paddling. It was 9:30 pm when this picture was taken. A very dramatic rapids/portage trail. Giant logs like tiny match sticks. Typical lake-river-lake system on the Kawishiwi. Lizard rock (OK, not really called that, but it looked like one). Dorsal fin rock (yup, not really called that either). Entering the next lake inlet. Timothy diving off a rock at our campsite on Fishdance Lake. Pictograph rock wall on Fishdance Lake seen from our campsite in the early morning. Feint pictographs depicting a family. One of so many rock islands. Timothy on one of the portages. A rare moment of relaxing at a campsite. Chicken hawk? Prairie chicken? At our island campsite on Lake Insula. No special effects or trick photography. The sky seriously looked like this one night at sunset. Fishing for walleye at 10:30 pm. One of dozens of loons. Wild blueberries free for the plucking. Jumping off “The Rock” at Lake Insula. Turtle laying eggs in the sand at our campsite. The most ferocious rapids/ portage near Hudson Lake, out of Lake Insula. Last rapids/portage at Lake One. “Before” shot on Day 1. “After” shot on Day 7.